In this post, I’ll share about the topic today that is super interesting for me personally – protein powder. In particular, I’ll cover the pros and cons of protein powder, and how it is made. In most cases, protein powder is associated with bodybuilders and athletes, and if you are none of them, there is a high chance you have never even considered adding protein powder to your diet. Personally, I’m mostly doing HIIT type training and I follow a 16/8 Intermittent Fasting regime. A combination of both has made my body the leanest it has ever been! But I also noticed that my muscle mass drops along with fat and while I enjoy being lean, I’d love to add a little bit more of a lean muscle mass and that’s where the protein powder comes into play. The most common type of protein powder sold is whey protein (non-vegan). It is made from the milky liquid that is left after making cheese and is then processed either by naturally drying or spray drying. Depending on the process, different forms of Whey Protein are produced. Each of these types has slightly different properties, e.g. isolates are processed to remove fat and lactose and hydrolysate whey proteins are pre-digested and partially hydrolyzed, meaning that they are a lot easier to digest. There are also vegan or plant-based protein powders, that are made from a variety of plants. More popular ones come from proteins found in coconut, pea, pumpkin or soy and have somewhat similar production process as in whey protein. To describe it in a very simple way, processed plants are mixed with water letting the proteins to dissolve. Then, using the spray drying process, proteins are isolated and fat is removed. This is how an isolate plant protein powder is made ready for consumption. 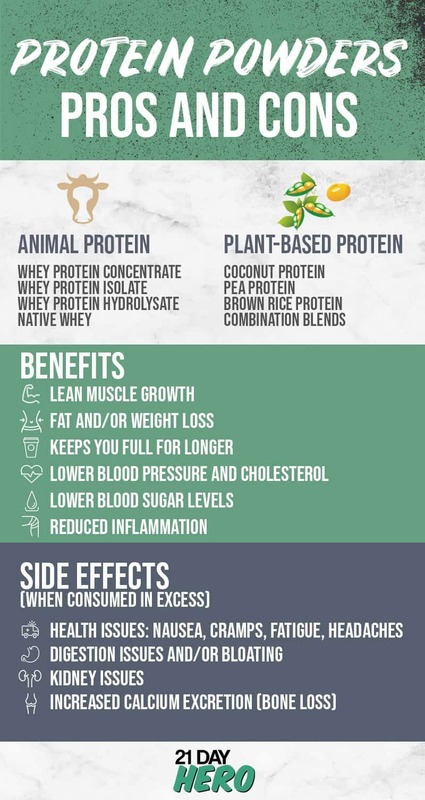 Plant-based protein powders bring a smaller environmental impact and carbon footprint and are also a great alternative for people with dairy intolerance. It’s worth noting though, that most of the soy produced in the United States is genetically modified and hence soy protein has caused some controversy in the last years. Some studies suggested that soy protein might decrease testosterone and increase estrogen hormone levels in males. But there is always more to the story, so I really encourage you to do your own research about soy before consuming products you are not sure about as we can’t possibly cover all aspects of the topic and I am neither a nutritionist nor dietician nor I pretend to be one. * My wife, who only takes vegan protein, prefers soy-free vegan powders, see more about her favorite recipes here. The biggest benefit of protein powder is the boost in muscle protein synthesis, or in other words – muscle growth. Protein cells include a number of amino acids that are the essential building blocks of muscles and the more protein you consume, the more muscle mass you gain over time. There are, however, limitation on how much protein our bodies can absorb in one go. There are various studies made that confirmed the fact that our bodies can take up max 20-40g of protein within the 3-4h, hence stuffing your protein shake with extra powder won’t do much for your muscle growth. Another potential benefit is a fat loss. There are studies made that showed obese subjects, who drank high-protein meal replacements as part of a low-calorie diet and lost more weight in a year than subjects who followed the diet without the replacements. Shakes typically contain fewer calories than full meals, and according to researchers at University of Texas Medical Branch, protein is the most satiating nutrient, meaning it can keep you fuller for longer periods of time compared to carbs or fats. That is also a reason why using protein powder as a supplement can be a great way to boost your protein intake while keeping calorie intake low. And while you can get all the protein you need by simply eating protein-rich meals, this would usually mean eating increased amounts of meat, dairy, and nuts. All of this, unfortunately, comes with extra fat, carbs and as a result, more calories. There are of course more benefits of consuming protein powder, like lowering your blood pressure, cholesterol, and blood sugar, and reducing inflammation. Too much protein – starting at about 35% of daily calories – can lead to health issues such as nausea, cramps, fatigue, headaches and bloating. Some experts think it can cause kidneys to have to work harder, leading to complications for those with existing kidney problems, or increase calcium excretion, causing bone loss. Dehydration is also a risk for those consuming a lot of protein. However, as mentioned earlier, most side-effects come from consuming above the recommended rate of the protein. Another thing to make sure is to use protein powder as a supplement and not a meal replacement and to keep consuming protein-rich meals that include all necessary micronutrients and fibers needed for a healthy functioning body. Unless you make a meal out of it (e.g. smoothie bowl) by adding fiber, healthy fats and other nutrients to it. Check out our article on 4 amazing protein shake recipes for more inspiration. Once again, don’t go above the recommended level and make sure to also enjoy protein-rich meals, whether it’s coming from vegan or non-vegan sources. Alright, folks, that’s all about protein powder and its pros and cons for today – I hope you enjoyed this blog post and a short podcast episode. If you want to get more into the topic of superfoods, join our 21-Day Superfood Challenge by subscribing here. Or any other 21-day Body & Mind Challenge! Do you take protein powder? If so, what is your favorite type of protein and how do you consume it? Leave a comment below or on the social media. Your feedback means the world to us!